When hubby and I went to Missouri last October, this sighting is so fascinating for me. I have seen movies about Amish but, I never seen one in person. 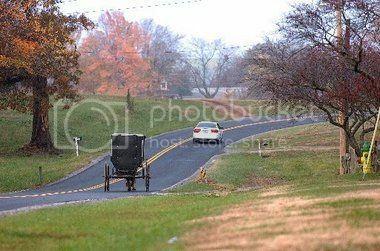 You know, with the clothes they wear, simple way of living and riding in their Amish buggy. As we drove down the country road to Keytesville, Missouri, hubby turn to a dirt road. No road signs and all we could see was vast bare land and father down the road, fields of farm. The cellphone lost signal, GPS lost signal and we haven't seen a single human being for 30 minutes. There were houses but, it seemed no one was there. Then, we saw ordinary houses with clothesline hang to dry at their front yard and a park buggy. We saw nobody. We were afraid to stop and ask. Oh yeah, we were lost. There was a tower that we saw and we follow that tower and thank goodness, we saw a pick up car. We asked the man where to find the Lake Nehai. The man said, we are on the right location but, we were at the back gate. We have to hurry because at certain time, it will be close. In short, we were lost for more than an hour driving on the dirt road, and off to the Amish neighborhood. We actually saw three Amish men but, they were not friendly looking. We arrived to our destination safely and our brand new car was covered in dust! Thick dust as a matter of fact. It was exciting an exciting experience but, I was not able to take photos because we were nervous. On the next day, we went to an Amish Store and I love their store. I saw real Amish people. They are friendly and the ladies at the store seemed shy and observant. Again, much as I wanted to take photos of them, just can't. I don't know if they are okay with that or they might get offended. They are pretty, the ladies in the Amish store.